As a teenager, I subscribed to several bodybuilding magazines, one of which was Dan Lurie’s Muscle Training Illustrated (MTI). Dan’s magazine was full of stories about the bodybuilding champs of the day and served as a catalog for his exercise equipment. One day, my father drove my brothers and me to Brooklyn to visit the Dan Lurie Barbell Company (see photo) on Utica Avenue. This would be the first of many such visits and the most memorable. 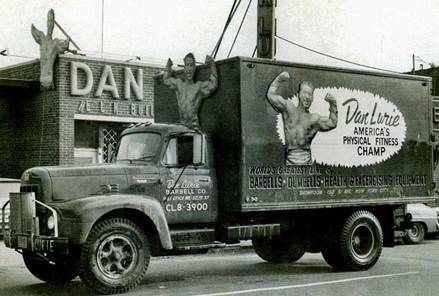 Outside Dan’s establishment was a huge vertical sign that displayed an image of him flexing his biceps in his famous strongman pose. As we walked into the building, we became mesmerized by giant posters of past and present champions covering every square inch of wall, from floor to ceiling. Posters of Arnold Schwarzenegger, Sergio Oliva, Steve Reeves, Larry Scott, and every champion imaginable hung there before our hungry eyes. Behind the shop’s counter was Tony Badel, a local bodybuilder employed by Dan, who was occasionally featured in Muscle Training Illustrated. As we looked around, we saw mountains of weight-plates, some taller than us. There were exercise machines everywhere and racks of current and old copies of Muscle Training Illustrated and books related to the art of muscle building. After a short while of touring the shop, Dan smilingly walked towards us and asked if we needed any help. It was great to finally meet him after having read his publication for so many years. He was very helpful that day in giving my brothers and me some beneficial training advice as he demonstrated several pieces of equipment for us. Dan Lurie was a legendary bodybuilding promoter, who in earlier years, competed successfully in the AAU Mr. America and later became a Sealtest Circus Strongman on TV; his motto was, “Health is your Greatest Wealth.” That was something I also prescribed to and it was good to see Dan looking and feeling the part he portrayed. That day, we bought an adjustable bench along with every past issue of MTI we did not already own. On the trip home, my brothers and I read the magazines in detail as we studied the photos of the great legends, and read the informative training programs for mass and strength. By the time we arrived home, we were psyched and headed for our gym. We had fire in our blood and were ready to hit the steel with a vengeance, as we were more determined than ever to become bigger and stronger than we ever dared to imagine. 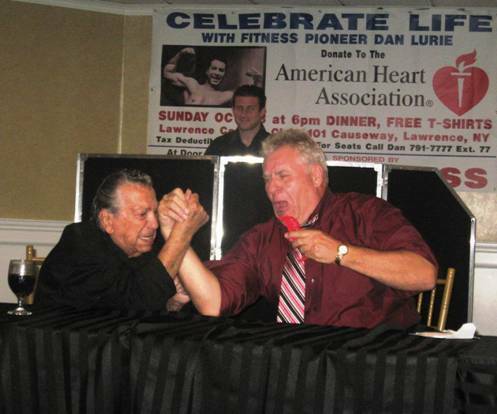 Fast forward several years and I would one day find myself opening Staten Island’s first bodybuilding gym, which primarily consisted of Dan Lurie barbell and exercise equipment. It would also be Dan Lurie’s World Body Building Guild (W.B.B.G.) that I would first step on stage as a competitor, strongman, and eventually as a judge. To make the circle complete, it would also be Dan Lurie’s magazine, Muscle Training Illustrated (MTI), that I would first reach a national audience as an author. Soon, I was inspiring others in much the same way as I had been inspired by his publication during my initial years in bodybuilding. In many ways, I owe Dan Lurie a lot. Because, like many of us, without his influence and help, we might have never come to realize our full potential. So, it was, without hesitation, that when invited to attend a fund raiser in regards to the following letter by Dan’s family, that I made it my business to be there. "Renowned physical fitness pioneer, Dan Lurie, was born with a heart defect and medical experts did not expect him to live past 5 years old. Currently at age 88 and counting, Lurie sure proved those doctors wrong, however, he recently suffered quite a startling near death experience. This past summer, Dan's heart stopped beating properly and eventually stopped altogether. He was electric shocked 17 times by an internal defibrillation device over the course of several weeks and he spent nearly 3 months in and out of hospitals receiving treatment. Against the odds, and after receiving an unheard of amount of electrical shocks to his body, Lurie proved that he is a true champion as he fought his way back to life and is currently on the road to a full recovery. The affair was heartwarming, as it was very evident that Dan not only had a very large family but a very loving one as well. You could feel the love that his wife, four daughters and son had for him. Not to mention the love of all of his nieces, nephews, grandchildren, and great grandchildren. Also in attendance to show their respect and admiration for him were his friends and fellow muscle buddies from days past and present. (see photo: Leon Brown, Kenny Jones, Dan Lurie, Danielle Kalish, Mario Strong, Scott, and Tony Coppeta). For me, the evening was somewhat sentimental as I was not only supporting Dan Lurie with his fund-raiser, but also honoring the man who had a direct impact on my life. It had been over forty years since I first met Dan and throughout all that time, I can truly say he has been a man of honor and integrity. This should come as no surprise, since Dan was born and raised during the Great Depression. A generation that developed strong character, perseverance, and fortitude in its people. So, in true form, Sealtest Dan served as a shining example of what it took to not only survive during such harsh times, but also, what it took to be a leader, so that future generations would follow with the same integrity and discipline as he displayed. 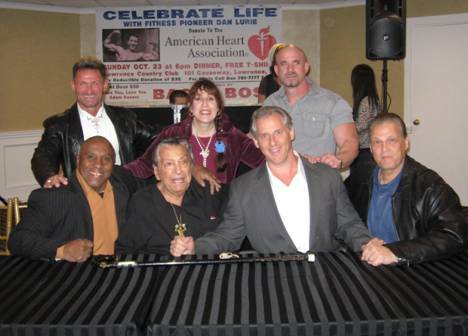 At the event, Dan told nostalgic stories of bodybuilding’s golden era, and even autographed copies of his autobiography, “Heart of Steel: The Dan Lurie Story,” which he gave free copies to some of the guest. He also told jokes, demonstrating that although he was up in years, he was as quick-witted as ever. He even arm-wrestled a former WWE star (see center) in much the same way he had done with President Ronald Regan many moons ago. For several decades Dan Lurie had been a major player in the bodybuilding world. He was at one time a major builder, marketer, retailer, and distributer of a vast line of exercise equipment and nutritional products. He had promoted countless physique competitions, some of which saw the greatest names in the sport on its stages. His various health and fitness related magazines reached an international market. And his motto of "Health is your Greatest Wealth" was followed by hundreds of thousands of fitness enthusiast who followed his advice of well-being and longevity. Although the decades had passed, Dan Lurie, who preached, “Health is your Greatest Wealth” throughout his lifetime, also showed another type of wealth at his fund-raiser that sadly is missing in today’s society. That wealth, which is truly the greatest of all, is that of the love for and from his family and friends. What can be better than that? Thanks Dan, for all you have done.